A dozen or so years ago, Carol — my photographer wife whose images often grace this space — was hired by Amtrak to go to Pueblo, Colorado, where the passenger railroad was testing America’s version of the Japanese “bullet train.” Although our nation was embarrassingly late to the party, high-speed train travel was finally pulling into the station. Carol photographed what came to be called the “Acela Express” inside and out, close-up and from a distance, as it tore, seemingly noiselessly, around a closed test track. Amtrak, the national passenger rail service cobbled together by the federal government from money-losing private passenger lines grudgingly operated by freight railroads on government orders, was about to get a dramatic makeover. Amtrak then brought an entire Acela Express train to the Washington-to-Boston “Northeast Corridor” for further testing, and I went along while Carol photographed it in what would be its working environment. It was quite an experience for two people who, years earlier, had booked what was intended to be a nostalgic and romantic train trip from Washington to New Orleans on Amtrak’s tired old “Crescent” route. That turned out to be a wretched ordeal in which, a dozen times or more, the hot, stuffy, lurching Amtrak train was shunted onto sidings to allow even slower-moving freight trains to pass. 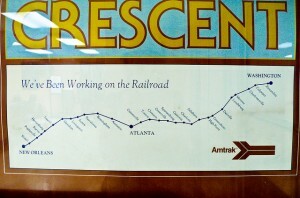 No wonder the Crescent ran three or four hours late each direction. 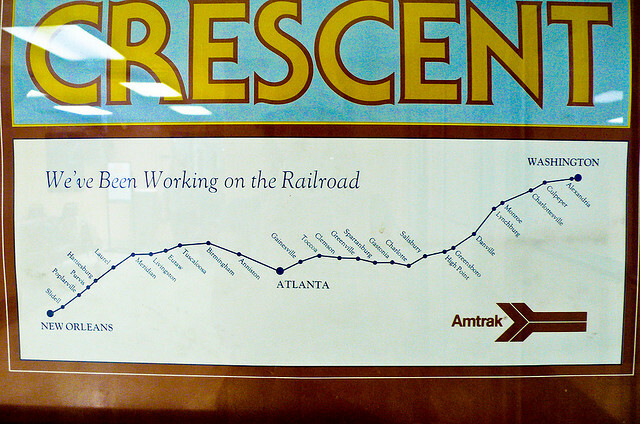 A suave journey on America’s version of Europe’s elegant Orient Express it was not. When it comes to expanding high-speed passenger service, Amtrak is stuck. Freight railroads own the tracks, not just from Washington southward but also just about every other place outside the Northeast Corridor. Amtrak even calls freight carriers and local commuter lines its “host railroads.” Even if it could miraculously get control of some of the tracks, they’re engineered for dawdling freight trains and would require billions of dollars’ worth of improvements. By contrast to the bleak reality elsewhere, our introduction to the Acela Express in the Northeast in 1999 was astonishing. 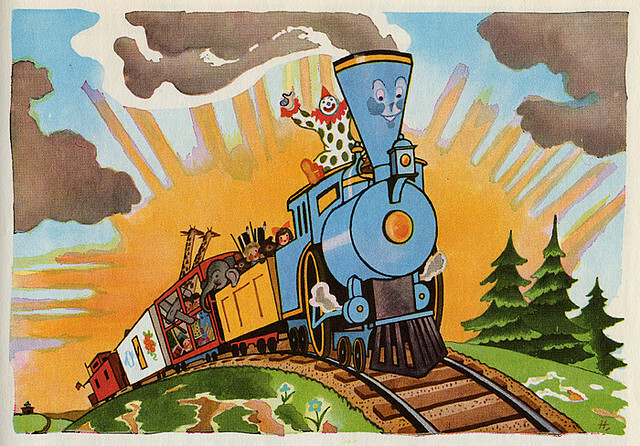 Since Amtrak had purchased the entire right-of-way between Washington and Boston, the snub-nosed machine seemed to fly, never once having to move aside for some clattering freight. Most memorable was the very start, as we stood in the New Carrollton, Maryland, station outside Washington, waiting for the speed train to arrive. Carol told me it would come stealthily, and indeed it seemed to dart in soundlessly, like a stainless-steel hummingbird. And there was no chug-a-chug-chug straining to get going again. Whoosh, like a puff of smoke, we were on our way. Looking at towns and stations and geographical features out the window was pointless. They were kaleidoscopic mélanges rushing by. 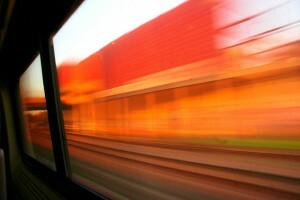 I could only imagine the blur outside an even faster bullet train. Since it was operating along a winding route originally built for steam locomotives, the express could rarely stretch out and gallop. 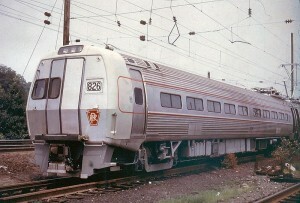 Once it entered service, travel times from Washington to New York (just under 3 hours) and New York to Boston (about 3 hours, 20 minutes) were only marginally faster than on Amtrak’s conventional “Metroliner” service. Acela Express could barely top 145 kph (90 mph) in heavily populated stretches of New England. Its weight constrained the speed, too: because of the tons of steel framing required under U.S. safety regulations, Acela Express coaches are almost twice as heavy as those pulled by other countries’ high-speed engines. This puts a tremendous strain on wheels and undercarriages, boosting costs and repair time. 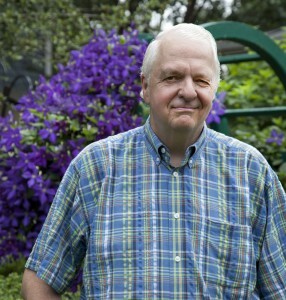 Still, George Warrington, Amtrak’s chief executive, felt comfortable in equating the introduction of high-speed rail service to the arrival of jet airplane travel and the building of the nation’s interstate highway system. “It will have that kind of power and force,” he predicted. But Amtrak has been “working on the railroad,” if not “all the livelong day” as the old American folk song goes, in the Northeast Corridor ever since, straightening and smoothing the track bed and inching up Acela Express’s speed — all the while whetting America’s appetite for such service nationwide. Not that it’s likely to ever approach the speeds that passengers enjoy in Germany, Japan, France, and China, where some zephyrs on wheels rush along at 500 kph and more. Take China’s new “Harmony” train, which covers the 1,318-km (820-mile) route between Beijing and Shanghai in five hours. That’s close to the distance between Washington, D.C., and Meridian, Mississippi — only 300 km short of New Orleans on the old Crescent run. Even if every slow freight moved aside and the Crescent kept to its schedule (fat chance), it would cover that distance in 21½, not 5, hours. Let’s back up, couple on a few extra cars, and start our tale back down the line. 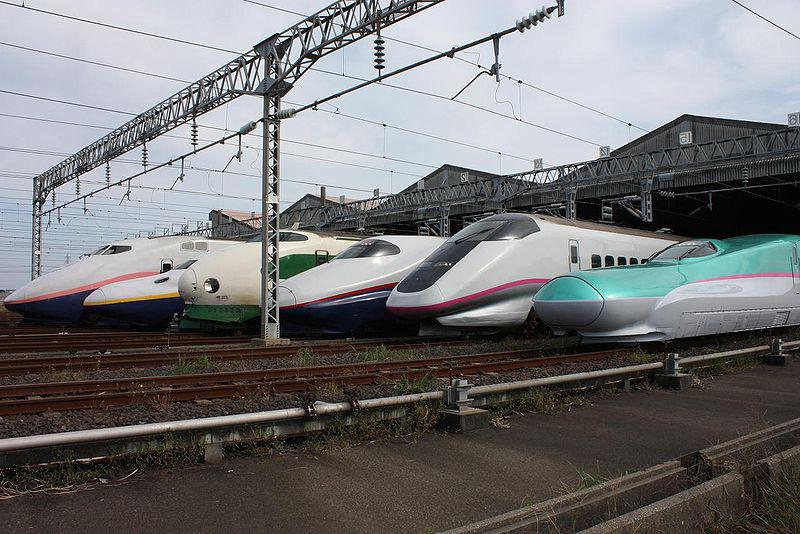 Almost from the moment that Japan inaugurated its bullet-train service in 1964, followed by France’s TGV and other European high-speed trains, American business travelers, especially, wondered why they, too, could not enjoy high-speed rail service. There was demand for big, powerful automobiles that guzzled lots of gasoline and ran over this spanking-new interstate highway system that everybody was in love with. And in fact by the 1960s it was two cars in every family. That of course has come back to bite us in the tail, and we now look longingly and enviously at many Asian countries and European countries that have taken the time and spent the money to develop high-speed rail. In 1970, Congress turned the dingy remnants of U.S. passenger-train service over to the new, government-owned National Rail Passenger Corporation, thankfully doing business under the catchier “Amtrak” name. Over the next 30 years, two presidents tried to kill the agency by zeroing-out its budget, only to have passenger service saved by Congress. While riders were comfortable with Amtrak’s moderately speedy Metroliner trains in the Northeast, most long-distance routes were slow, inefficient, hemorrhaging money, and national disgraces when compared to long-run service as nearby as Canada to the north. Its trains weren’t that much faster, and tickets certainly weren’t cheap. But the Canadian trains held onto some of the white-tablecloth elegance of railroading’s golden era. Cross-country, their schedules even allowed for stays in bustling Toronto, bilingual Montreal, spectacular Niagara Falls, and the breathtaking Canadian Rockies for those who wanted them. 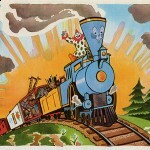 All the while, despite record revenues, Amtrak lost money on just about every long-distance run. Its annual losses approached $500 million several times in the 1980s and ’90s. So Congress put the passenger-rail corporation on notice: We’ll help you buy new equipment, lawmakers said, but you must sink or swim by 2003. There will be no more operating subsidies. That ultimatum meant that, to survive, Amtrak needed a more businesslike approach — and fast. Its board determined that high-speed service could be a big money maker, especially if it could lure business travelers off the airlines’ short-haul shuttles. On this point for once, timing broke the railroad’s way, since air-shuttle service was developing all the amenities of a cattle round-up. And in most towns you had to take an expensive taxi ride just to reach the corral. For executive travelers, especially, the idea of quick, first-class downtown-to-downtown rail trips had great appeal. 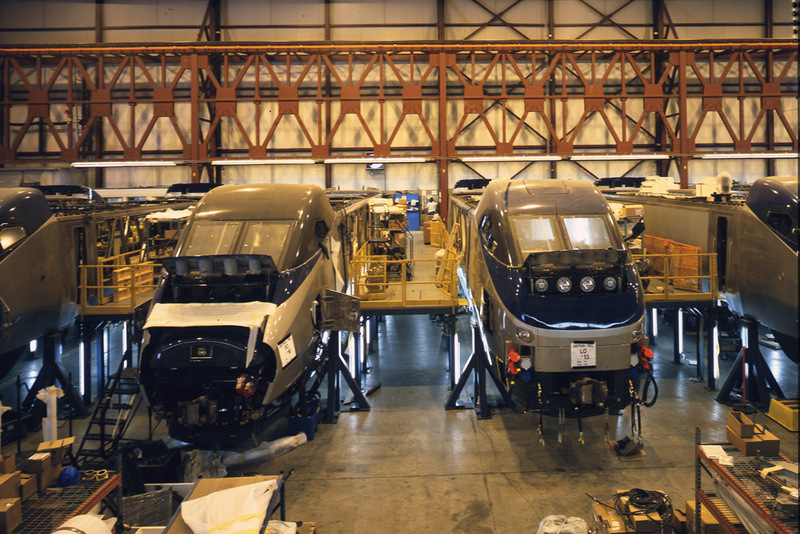 In 1996, after more than a year of winnowing candidates to build American high-speed trains, Amtrak awarded the $754-million contract to a French and Canadian consortium called Alstom-Bombardier. 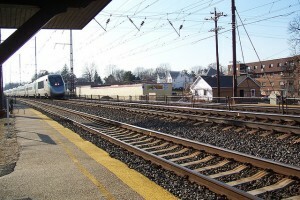 Amtrak then spent more than $1 billion to finish electrifying the rail line between New Haven, Connecticut, and Boston. 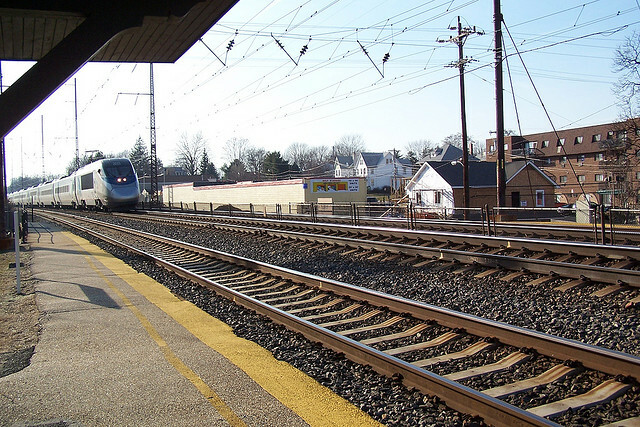 Only electrically powered trains could produce the acceleration necessary to get out of stations and up to speed quickly — crucial when the Acela Express would be making 20 or more stops on certain runs. Other improvements included long sections of welded rails and sturdier concrete ties to replace 360,000 wooden ties. 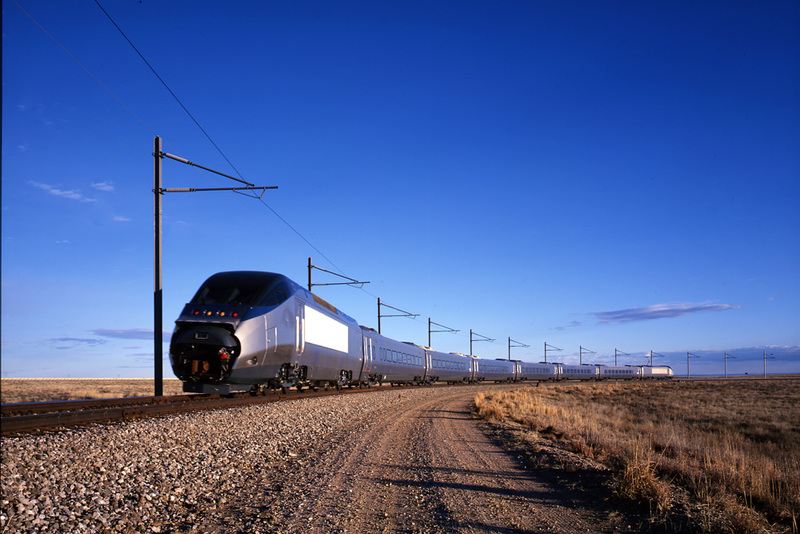 In 1998, Alstom-Bombardier delivered the first $20-million Acela Express trainset — that’s right, $20 million for one train — for testing. 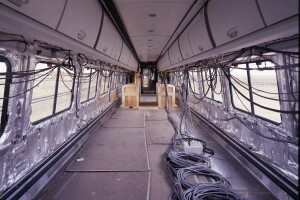 It is called a trainset because six coaches and two aerodynamic, arrow-shaped “power cars” — one at each end of the train so it never has to be turned around — are tightly connected physically and by computer lines. You cannot break them apart for assembly and reassembly into other trains at rail yards. Each trainset consists of those power cars front and back, four business-class coaches, a first-class car, and a “café/bistro car.” Try to find one of THOSE on an airplane shuttle flight. Acela Express trains are not simply copies of European or Japanese trains. They employ a system in which sensors tilt the train going into curves, reducing centrifugal force to the point that many passengers, including Carol and me, report that they barely notice the twists and turns. The coaches almost never shimmy, throwing people into each other and drinks into others’ laps. So Amtrak had its new, classy high-speed train. To market it, the corporation felt it important to give the experience its own brand — one that over time would imprint the dual message of speed and quality. It needed a new, intriguing word that would capture the imagination. 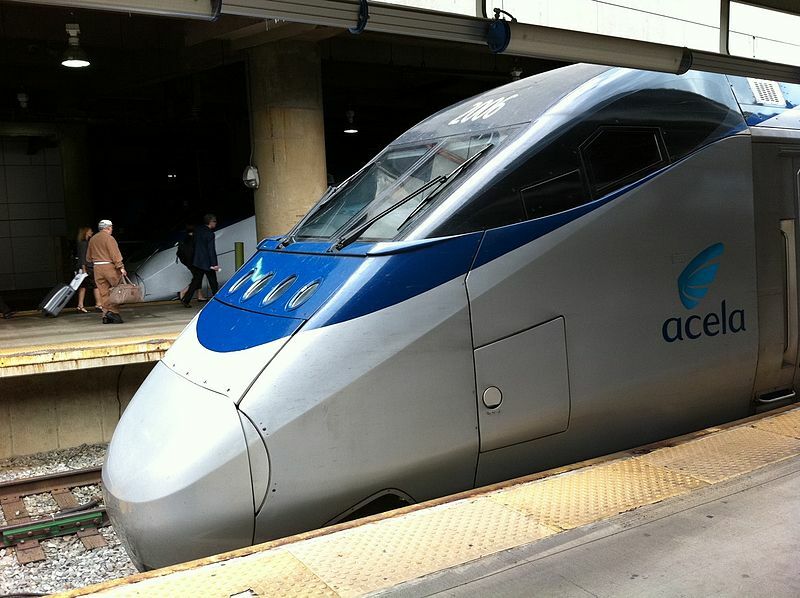 Working with a California company called IDEO, it hit upon “Acela” — suggesting “acceleration” and “excellence.” The high-speed train would be the Acela Express, and traditional, but upgraded, trains would be called Acela Regional and Acela Commuter. That blurred the branding a bit, though, since most customers who asked for Acela service had the high-speed train in mind. 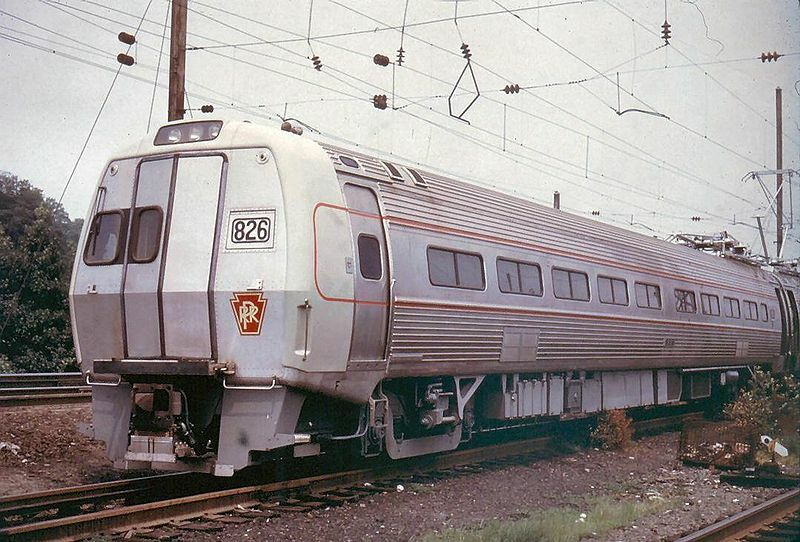 It took awhile for passengers to also associate the word with the comfy but slower Metroliners that had served the Northeast Corridor for 30 years. IDEO’s Brent Oppenheimer told me that market research indicated that Amtrak customers were more interested in profitable use of their time than in pure speed or fancy equipment, “either to relax, to be somewhat decadent, enjoy a meal, have a social arrangement — things that obviously you can’t do on a plane.” Especially on a quick, up-and-down, wedge-’em-in shuttle flight in which a meal consisted of a tiny bag of peanuts if you were lucky. 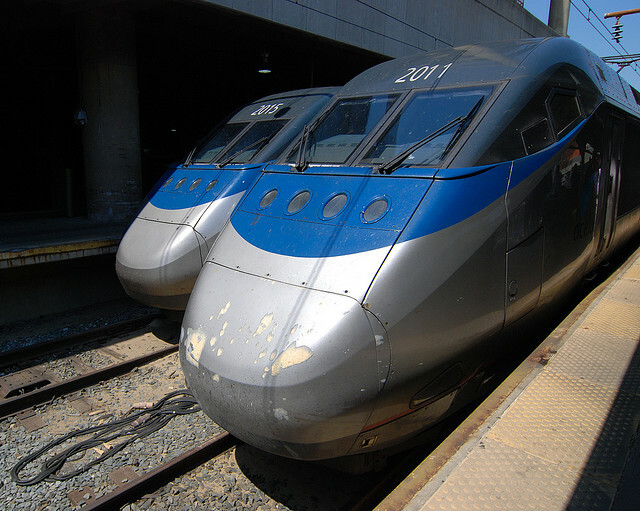 With all that as a backdrop, Acela Express at last opened its doors to passengers at the end of 2000, and Warrington told the nation that 36 states outside the Northeast Corridor were also “working with Amtrak” to introduce high-speed corridors of their own. 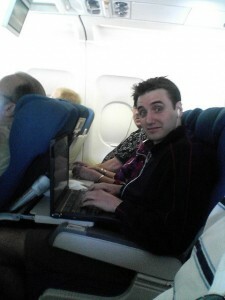 That was 10½ years ago, and that work hasn’t gone very far. Amtrak knew that it would be difficult, if not impossible, to spread high-speed train travel across the country using the same electrified-rail technology. They’d be looking to convert a vast, somewhat rusted, spider web of rail lines, which are set up for fossil-fuel diesel locomotives that pull thousands of freight cars. Amtrak tested and bought some turbine-powered “turbotrains.” Bombardier’s experimental “JetTrain” locomotive even toured North America in the early 1990s in an effort to raise the technology’s public profile. But again because U.S. passenger rail cars are so heavy, turbine-powered engines could not achieve impressive-enough speeds, and Amtrak sold or scrapped the ones it had. So not a single high-speed train runs anywhere south of Washington or ﻿﻿west of Philadelphia. At least until you get to Japan. 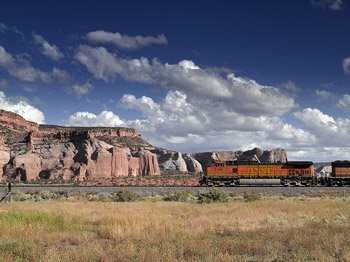 There are studies and visions, projections and plans, but only lumbering freights and occasional long-distance Amtrak trains ride the rails. Next year, cash-strapped California is scheduled to begin construction of a dedicated high-speed rail corridor between Anaheim, south of Los Angeles, and San Francisco, far up the coast. And this past May — two years after Congress allocated $8 billion for “projects that support the development of intercity high speed rail service” as part of an economic stimulus package, U.S. Transportation Secretary Ray LaHood announced the awarding of $2 billion in grants that would allow the purchase of state-of-the-art engines and rail cars and pay for upgrades of century-old infrastructure in selected Midwest corridors. But passengers departing Chicago or St. Louis won’t be riding bullet trains any time soon. In fact, Republican governors or governors-elect in Florida, Wisconsin and Ohio opposed the spending of public funds on high-speed rail entirely. It’s too costly given the lack of immediate benefits, they said. Florida Governor Rick Scott formally turned down federal funds, killing a high-speed rail project whose planning was, so to speak, well down the track. So LaHood sent the three states’ money elsewhere. Amtrak has also created a department devoted to nothing but high-speed rail. But people in Kansas and Utah and Georgia shouldn’t get excited. Its initial emphasis will be on increasing the number and speed of trains in the already well-served Northeast Corridor. Remember, a couple of postings ago, my description of the powerful influence that streamlined diesel trains had on everything from architecture to the design of salt shakers in the 1930s, before automobiles and air travel had fully stolen the hearts of the traveling public? As late as World War II in my hometown of Cleveland, Ohio, as I’ve also told you, 40 trains a day still arrived or departed beneath the marble corridors and busy shopping arcades in the Terminal Tower. Now Amtrak trains pass through town only a couple of times a day — stopping at a small station along Lake Erie, nowhere near the great downtown skyscraper. Although skeptics doubt that impatient Americans will return in vast numbers to long-distance train travel, no matter how fast, recent airline ticket-price surges and spiraling baggage fees, long airport check-in lines, intrusive body inspections, and indifferent service once aboard airplanes have made the prospect of fleet, passenger-pampering train service an attractive idea once again. And that it will be — an idea — for some time in most of the nation. It would take a national right-of-way and rail-building campaign many times the scope of the vaunted Works Progress Administration of the Great Depression — plus an all-out and savvy p.r. blitz — to turn the dream of a nationwide high-speed rail network into reality. On down the track somewhere. Seen by some as a metaphor for the American Dream — proving that hard work and perseverance pay off — the tale describes a stranded train that’s looking for a big, strong engine to pull it over a mountain. None will attempt it, but a little blue engine gives it a try and successfully pulls the cars over the mountain while repeating, “I Think I Can, I Think I Can” over and over again. Kaleidoscopic. Something that changes patterns wildly. The name comes from the kaleidoscope, a tube-like toy containing colored glass and mirrors. When the holder twists the tube, the glass takes on new and sometimes amazing patterns, visible through the device’s eyehole. Mélange. A mixture or medley, often in no apparent pattern. Shimmy. To wobble or vibrate, especially side to side. Very interesting and informative. I learned a lot. Now that I think back over history, I see the big picture. I feel such speeds may create more problems than saving travel time.